This traditional napery is ideal for preventing soiling, staining or wear and tear on living room furniture such as sofas, settees and chairs. It is recommended that you hand wash these arm caps. Please note that all measurements are approximate and photographs are for illustrative purposes only. 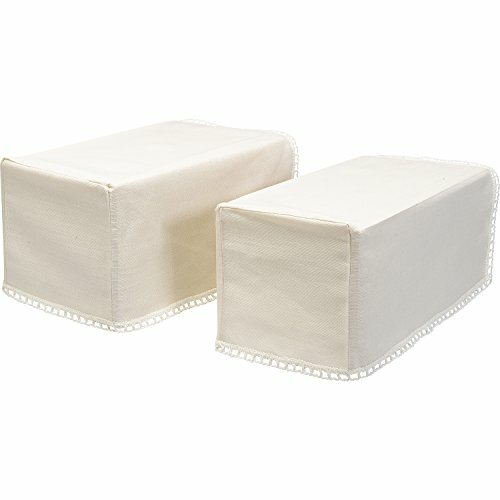 These decorative arm caps have a lace trim edge and are ideal for protecting your sofas and arm chairs whilst providing a timeless look to your decoration. Please select size from dropdown menu. Colour: Beige with a Lace Trim Edge. Measurements: Extra Large XL Square Material: 51% Linen & 49% Cotton. Care Instructions: Hand wash only. Mini Square Armcaps - Length: 13" (33cm) x Width: 4.25" (11cm) x Depth: 5" (13cm), Standard Square Armcaps - Length: 13.5" (34cm) x Width: 6.5" (16cm) x Depth: 7" (17.5cm), Extra Large Square Armcaps - Length: 13.5" (34cm) x Width: 8" (20cm) x Depth: 8.25" (21cm) or Single Chairback - Length: 22" (55.5cm) x Width: 15.5" (39cm) approx. It is recommended that you hand wash these furniture covers. Please note that all measurements are approximate and photographs are for illustrative purposes only. If you have any questions about this product by Classic Home Store, contact us by completing and submitting the form below. If you are looking for a specif part number, please include it with your message.